Background: Uncertainty exists in deciding the optimal stimulation protocol in poor responders undergoing in-vitro fertilization (IVF). Our study aims to compare microdose flare and antagonist protocols in the management of patients considered to be poor responders, chosen according to Bologna criteria. Materials and Methods: In a prospective observational study, 66 poor responders as per the Bologna criteria were recruited to undergo IVF-ICSI cycles using either microdose flare protocol (Group I; n = 28) or the flexible antagonist (Group II; n = 38). Pregnancy rate per cycle was taken as the primary outcome. Total days of stimulation, total dose of gonadotropins, estradiol (E2) and progesterone levels on the day of human chorionic gonadotropin (hCG) trigger, cycle cancellation rate, total oocytes retrieved, total Metaphase II (MII) oocytes, number of embryos formed, number of Grade I embryos, fertilization and cleavage failure, total number of cycles that did not reach embryo transfer were taken as secondary outcome measures. Results: There was no significant difference in the pregnancy rates between the two groups. The microdose flare group (Group I) had higher levels of E2 on the day of hCG trigger (P = 0.03) and more number of MII oocytes (P = 0.04). Conclusion: Patients stimulated with the microdose flare protocol had significantly more E2 levels with the recovery of more MII oocytes, but this did not transform to higher pregnancy rates. A large multicentered randomized trial would be required to draw definite conclusion to achieve significant difference between the cycle cancellation and pregnancy rates between these two protocols for poor responders. Uncertainty exists in deciding the optimal stimulation protocol in poor responders undergoing in-vitro fertilization (IVF). Poor ovarian response (POR) is considered to decrease the fundamental potential of ovaries in response to conventional stimulation with FSH/human menopausa gonadotropin (HMG) leading to ovarian suppression, decreased follicular production, low estradiol (E2) levels with the recovery of less number of oocytes at the time of ovum pickup, consequently lesser embryos available for transfer and vitrification. The prime pathophysiology is the dramatic reduction in ovarian reserve, which eventually causes the deterioration of oocyte quality to an extent that the development of resulting embryos is altered, diminishing the chances of live birth at IVF. For long, there has been controversy over the most appropriate definition for poor responder with different studies using different yardsticks to judge ovarian response in IVF-ICSI cycles. Thus, realizing the need for a standard definition, which could be accepted internationally across borders, the ESHRE working group brought forth the Bologna criteria in 2011 to define poor response to ovarian stimulation. Accordingly, the minimal criteria needed to define POR include the presence of at least two of the following three features: (i) advanced maternal age (≥40 years) or any other risk factor for POR; (ii) previous POR (≤3 oocytes with a conventional stimulation protocol); (iii) an abnormal ovarian reserve test (ORT) [i.e., antral follicular count (AFC) of 5–7 follicles or anti-Mullerian hormone (AMH) between 0.5 and 1.1 ng/ml]. The last decade has also seen gonadotropin releasing hormone antagonist (GnRH-ant) protocol emerging in IVF practice, with pregnancy rates similar to the time-tested agonist protocol. Extensive research (randomized and nonrandomized trials) has been performed in the past to evaluate the ovarian response using different ovarian stimulation protocols in poor responders but none have been considered to be the most appropriate for such patients. Recognizing the potential for oversuppression, standard dose and microdose flare protocol have been developed to decrease this ovarian suppression. These protocols utilize the initial stimulatory effect of gonadotropin releasing hormone agonists (GnRH-a) on the pituitary gonadotropin release in the follicular phase of the cycle followed by gonadotropin stimulation. In keeping with this physiology, the microdose flare should be more acceptable in improving the yield of oocytes after controlled ovarian hyperstimulation in this subgroup of women. 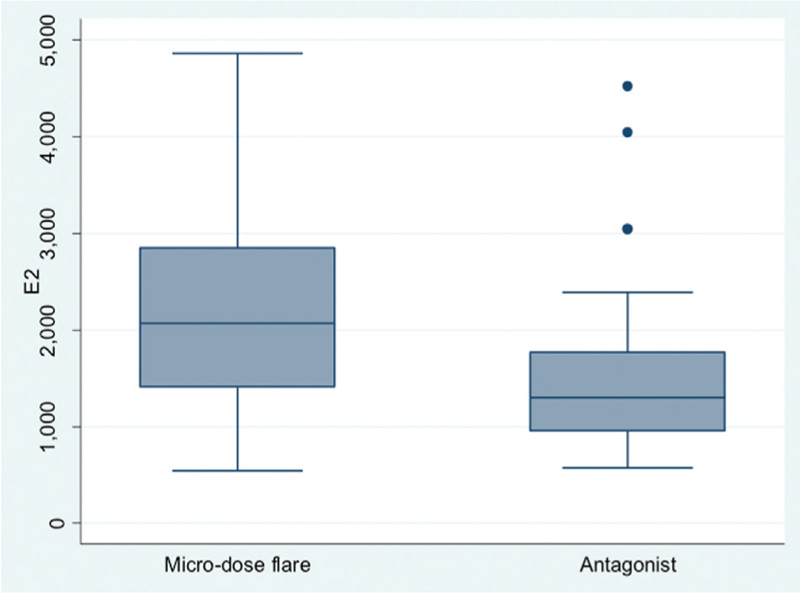 The present study was planned to compare the efficacy of microdose flare versus the antagonist protocol in poor responders, chosen according to Bologna criteria. This was a prospective observational study conducted at the Assisted Reproduction Unit of the All India Institute of Medical Sciences, New Delhi, India. In a study period extending from January 2013 to October 2016, a total 1039 women underwent a single cycle of IVF-ICSI. Of these patients, 66 (6.4%) women were labeled as poor responders as per the Bologna criteria. Twenty-eight women were stimulated with microdose flare protocol (Group I) and 38 women by the antagonist protocol (Group II). The choice of protocol for ovarian stimulation was made after discussing the two protocols in detail with the patients. Ethical clearance was obtained by the Institute Ethics Committee. Informed consent was taken from all patients prior to the study. Poor responder was defined as per the Bologna Criteria. Patients were included if any two of the following were present: (1) age >40 years, (2) poor response in prior IVF cycle with <3 oocytes retrieved after a conventional stimulation protocol, (3) an abnormal ORT: AMH <1.1 ng/ml or AFC <7. Women with a single ovary uterine factor, and who did not give consent were excluded from the study. This included ORTs, namely the day 2 serum follicle stimulating hormone (FSH) levels, serum AMH levels and AFC. AMH measurement was performed using the Gen II ELISA assay by Beckmann and Coulter Inc., USA. FSH was measured by the ADIVA Centaur CP Immunoassay System, Siemens, USA. AFC of each patient was measured at the assisted reproduction technique (ART) laboratory, from day 2 to 6 of the menstrual cycle using a two-dimensional transvaginal transducer on a GE Voluson S6 System, USA. Antral follicles ranging from 2 to 8 mm in each ovary were measured and combined to give the AFC. Patients were pretreated with a combined oral contraceptive pill from day 5 to 25 of the previous menstrual cycle. The women then received Inj Leuprolide (Lupride; Sun Pharmaceutical, Mumbai, India) 50 μg subcutaneously twice a day from day 2 of the next menstrual cycle. Recombinant FSH (Gonal F; Merck Serono, Mumbai, India) was administered from the next day. Ovarian response was monitored by transvaginal ultrasound from day 5 of stimulation and dose of gonadotropins was altered according to the response. Recombinant human chorionic gonadotropin (hCG), 250 IU subcutaneously (Ovitrelle; Merck Serono, Mumbai, India) was given for ovulation trigger when at least two leading follicles reached a mean diameter of 18 mm. Both GnRH-a and gonadotropins were administered till the day of trigger. Ovarian stimulation was started from day 2 of the menstrual cycle with recombinant FSH (Gonal F; Merck Serono, Mumbai, India). Ovarian response was monitored by transvaginal ultrasound from day 5 of stimulation, and the dose of gonadotropins was altered according to the response. GnRH-ant Cetrorelix (Cetrotide; Merck Serono, Mumbai, India) 0.25 mg s.c. daily was started when a lead follicle measured >14 mm. Recombinant hCG, 250 IU subcutaneously (Ovitrelle; Merck Serono, Mumbai, India) was given for ovulation trigger when at least two leading follicles reached a mean diameter of 18 mm. E2 and progesterone (P4) levels were measured on the day of ovulation trigger and ovum pickup was performed under conscious intravenous sedation, 35–36 h after the hCG trigger. Intracytoplasmic sperm injection (ICSI) was performed 2–4 h after egg recovery and fertilization was checked for after 16–18 h. Embryos were cultured in sequential G media (Vitrolife, Sweden). Embryo grading was performed from Grade 1–4 according to zonal thickness, fragmentation and blastomere size. Embryo transfer (ET) was performed under ultrasound guidance on day 2 or day 3. Maximum two embryos were transferred. Luteal support was given in the form of micronized P4 100 mg intramuscular or 400 mg twice daily pervaginally from the day of ovum pickup. Pregnancy was confirmed by serum β hCG 12–14 days after ET. Clinical pregnancy was defined by the presence of fetal cardiac activity 4–5 weeks after ET. Cycle was cancelled with the development of <3 follicles of size 14 mm with maximum doses of stimulation (450 IU of gonadotropins), after 12 days of stimulation. The primary outcome measure in this study was taken as clinical pregnancy rate per cycle. Secondary outcome measures were total days of stimulation, total dose of gonadotropins used, E2 and P4 levels, cycle cancellation rate, total oocytes retrieved, total Metaphase II (MII) oocytes, number of embryos formed, number of Grade I embryos, fertilization and cleavage failure, total number of cycles that did not reach ET. Statistical analysis was performed using STATA version 9.0 (StataCorp, College Station, Texas, USA) software. Data were presented as mean ± SD, median (minimum to maximum) or numbers (%). Student’s t test or Wilcoxon rank-sum (Mann–Whitney) test were applied to compare data between the two groups as appropriate. P value <0.05 was considered significant. A total of 66 patients who were recognized as poor responders according to the Bologna criteria were included in the study; 28 were stimulated with microdose flare protocol (Group I) and 38 by antagonist protocol (Group II). Majority of the patients (38) (57.6%) were undergoing IVF for the second time; 16 (24.2%) patients were undergoing treatment for the first cycle, 9 (13.7%) for the third time, 3 (4.5%) for the fourth time. [Table 1] shows the baseline characteristics of the study population. There was no statistically significant difference in the age, body mass index (BMI), incidence of primary infertility, FSH, AMH levels and AFC of the patients in the two groups. [Table 2] shows the comparison of primary and secondary outcomes of the patients in the two groups. There was no difference in the pregnancy rate per cycle and pregnancy rate per ET between the two groups. 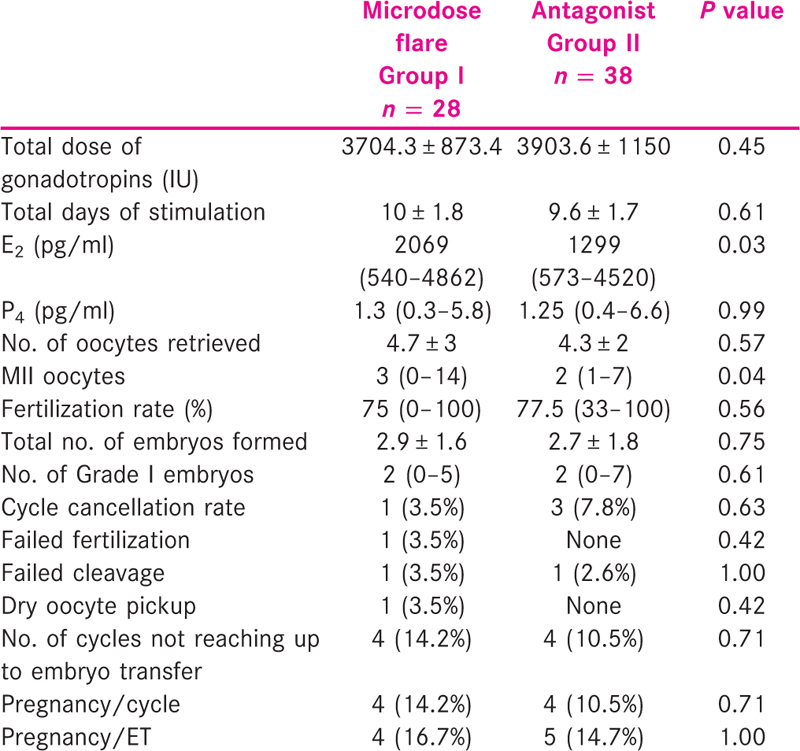 Significantly higher median levels of E2 on the day of hCG were observed in the microdose flare group [2069 (540–4862) vs. 1299 (573–4520), P = 0.03] [[Table 2], [Figure 1]] with more MII oocytes [3 (0–14) vs. 2 (1–7), P = 0.04] [[Table 2], [Figure 2]]. Rest of the secondary outcome measures (P4 levels, total no. of oocytes retrieved, fertilization and cleavage rate, total no. of embryos formed, Grade I embryos, cycle cancellation rate and pregnancy rate) were not different between the two groups as mentioned in [Table 2]. GnRH-a protocol is in use since 1980s to prevent premature luteinization and ovulation. However, there are concerns over its use in IVF because GnRH-a leads to ovarian oversuppression thereby resulting in the reduced number of stimulated follicles as well as an increased dose of gonadotropins in poor responders. Thus, the management of patients expected to show an unsatisfactory response to conventional ovarian stimulation is an extremely challenging task and remains controversial due to conflicting results. Different strategies (GnRH-a flare, antagonist, antagonist-letrozole protocol, luteal phase estrogen priming, luteal phase testosterone priming, growth hormone prior to the antagonist protocol) have been proposed in such patients undergoing ART but results are heterogeneous, and the best protocol is yet to be defined. 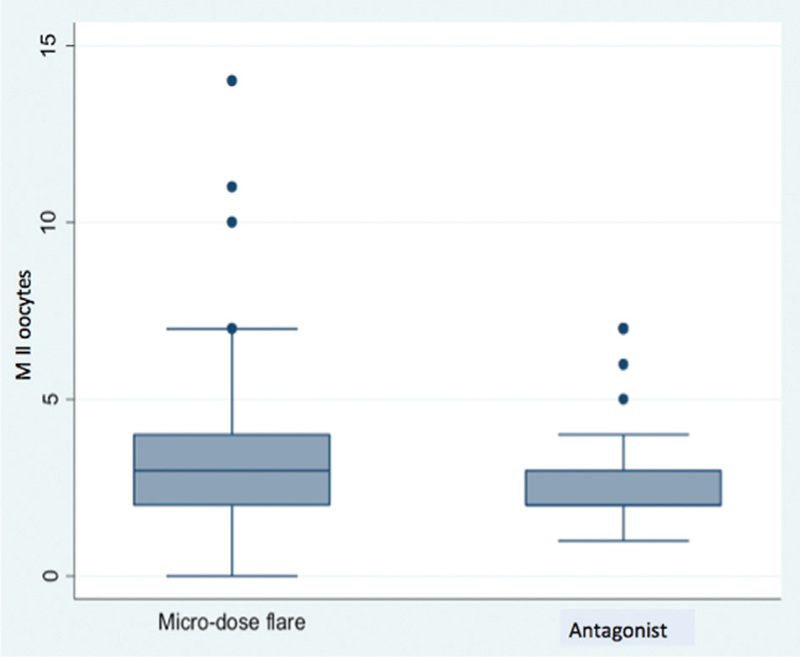 The microdose flare and antagonist protocols have been most commonly used and compared in the expected poor responder group. This is one of the first few studies to compare the two protocols in the patients that have been recruited according to the Bologna criteria. The microdose flare protocol has been reported to lead to a better ovarian response in known poor responders, decrease cycle cancellations and improve clinical pregnancy rates.,, The endogenous release of gonadotropins due to the administration of small quantities of GnRH starting on day 2 of the cycle facilitates a better follicular recruitment. OCPs given in the previous cycle prevents corpus luteum formation and also, the GnRH-a helps in preventing premature luteinization. Akman et al. compared the antagonist to agonist flare-up protocol. They defined poor responder as a patient with FSH levels of >15 mIU/ml with E2 levels of <500 pg/ml on the day of hCG trigger and recovery of <4 oocytes in a prior IVF cycle. They observed similar pregnancy and implantation rates between the two groups but higher E2 levels in the agonist flare group. Their results were similar to as observed by Mohamed et al. with similar pregnancy rates, more total days of stimulation, and higher E2 levels in the microdose flare group. The results are similar to the present study with significantly more E2 levels in the microdose flare group with, more number of days of stimulation, but with similar pregnancy outcomes. Pregnancy rates, although not significantly different between the two groups, were lower than usually observed in normo-responders. This was expected, because the study has been conducted on patients expected to show a poor response. We observed 14.2% versus 10.5% (P = 0.71) pregnancy rate per cycle in microdose flare versus antagonist group. Mohamed et al. observed pregnancy rate per cycle of 24.7% in the microdose flare group and 17.5% in the antagonist group. This difference too was statistically not significant. According to the study by Mohamed et al., we calculated a sample size of 701 patients per group with 5% level of significance and 90% power to obtain a significant difference in pregnancy rates. Recruiting such large number of patients according to the Bologna criteria would require a considerably longer period of time for the study to be completed and multicentric involvement. The total dose of gonadotropins, even though lesser in the microdose flare group (3704.3 ± 873.4 vs. 3903.6 ± 1150, P = 0.45), did not reach statistical significance possibly due to small sample size. The recovery of total number of oocytes was similar in the two groups although the number of MII oocyctes was significantly higher in microdose flare group [median values 3 (0–14) vs. 2 (1–7), P = 0.04]. This was similar to as observed in another study by Demirol and Gurgan, where the authors observed significantly lower doses of gonadotropins, more number of days of stimulation and recovery of more MII oocytes with the microdose flare group. This study, however, also reported better implantation rates with microdose flare group although the pregnancy rates were not statistically different. It is important to note that even with comparable total dose of gonadotropins used in the two groups, the microdose flare group had significantly higher E2 levels, with the retrieval of more MII oocytes, possibly showing a better response than the antagonist group. The management of POR in women undergoing ART leading on to cycle cancellation and reduced live birth remains challenging and controversial for clinicians, because there is no shared vision for the most suitable treatment protocol. Patients stimulated with the microdose flare protocol had significantly more E2 levels with the recovery of more MII oocytes, although the pregnancy rates were comparable in the two groups. Further research is needed to assess the superiority of microdose flare over antagonist protocol. Preferably large multicentered randomized trials are required to draw definite conclusion to achieve significant difference between the cycle cancellation and pregnancy rates between these two protocols for poor responders. Ferraretti AP, La Marca A, Fauser BC, Tarlatzis B, Nargund G, Gianaroli L. ESHRE consensus on the definition of ‘poor response’ to ovarian stimulation for in vitro fertilization: The Bologna criteria. Hum Reprod 2011;26:1616-24. Yarali H, Esinler I, Polat M, Bozdag G. Antagonist/letrozole protocol in poor ovarian responders for intracytoplasmic sperm injection: A comparative study with the microdose flare-up protocol. Fertil Steril 2009;72:231-5. Detti L, Williams DB, Robins JC, Maxwell RA, Thomas MA. A comparison of three down regulation approaches for poor responders undergoing in vitro fertilization. Fertil Steril 2005;84:1401-5. Schoolcraft W, Schlenker T, Gee M, Stevens J, Wagley L. Improved controlled ovarian hyperstimulation in poor responder in vitro fertilization patients with a microdose follicle-stimulating hormone flare, growth hormone protocol. Fertil Steril 1997;67:93-7. Surrey ES, Bower J, Hill DM, Ramsey J, Surrey MW. Clinical and endocrine effects of a microdose GnRH agonist flare regimen administered to poor responders who are undergoing in vitro fertilization. Fertil Steril 1998;69:419-24. Schmidt DW, Bremner T, Orris JJ, Maier DB, Benadiva CA, Nulsen JC. A randomized prospective study of microdose leuprolide versus ganirelix in in vitro fertilization cycles for poor responders. Fertil Steril 2005;83:1568-71. Akman M, Erden H, Tosun S, Bayazit N, Akosy E, Behceci M. Comparison of agonistic flare up protocol and antagonistic multiple dose protocol in ovarian stimulation of poor responders: Results of a prospective randomized trial. Hum Reprod 2001;16:868-70. Mohamed KA, Davies WA, Julian Allsopp J, Lashen H. Agonist “flare-up” versus antagonist in the management of poor responders undergoing in vitro fertilization treatment. Fertil Steril 2005;83:331-5. Demirol A, Gurgan T. Comparison of microdose flare-up and antagonist multiple-dose protocols for poor-responder patients: A randomized study. Fertil Steril 2009;92:481-5. Polyzos NP, Nwoye M, Corona R, Blockeel C, Stoop D, Haentjens P et al. Live birth rates in Bologna poor responders treated with ovarian stimulation for IVF/ICSI. Reprod Biomed Online 2014;28:469-74. Busnelli A, Papaleo E, Del Prato D, La Vecchia I, Iachini E, Paffoni A et al. A retrospective evaluation of prognosis and cost-effectiveness of IVF in poor responders according to the Bologna criteria. Hum Reprod 2015;30:315-22. Marca L, Grisendi V, Giulini S, Sighinolfi G, Tirelli A, Argento C et al. Live birth rates in the different combinations of the Bologna criteria poor ovarian responders: A validation study. J Assist Reprod Genet 2015;32:931-7.